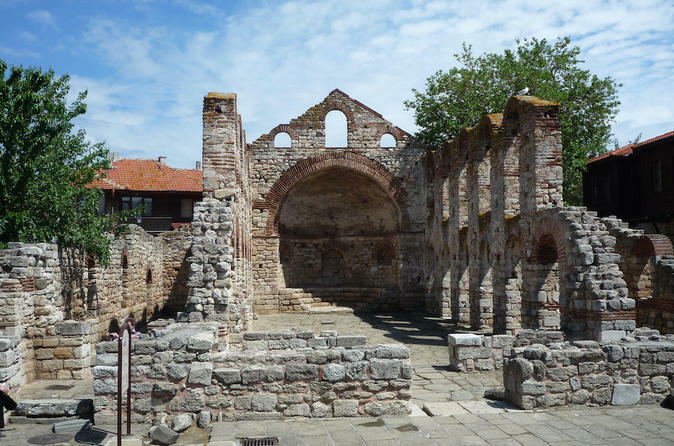 Explore the ancient Black Sea towns of Nesebar and Sozopol on this 10-hour trip from Varna. Traveling by climate-controlled car in the company of a guide, visit church-dotted Nesebar and learn about its rich architectural history. Get to know Sozopol’s old town, including many historical buildings constructed from the mid-18th century to the early 19th century. Hotel pickup and drop-off is included. Meet your guide at your Varna accommodation at 9am for your 10-hour day tour of Nesebar and Sozopol. Drive 1.5 hours along the seaside in a comfortable climate-controlled vehicle to Nesebar, a town with more than 40 churches. Discover rich architectural history of these buildings and admire the Church of St. Sophia and the Basilica of the Holy Mother of God Eleusa. Learn about the Byzantine, Bulgarian, and Ottoman rule of the city, understand how the architecture marks the gradual development from early Christian basilicas to medieval cross-domed churches. Pause for lunch at a local fish restaurant (price not included) and stop briefly in the port city of Burgas before continuing to Sozopol. Explore Sozopol’s historical old town. This area includes more than 180 residences, constructed from the 18th century to the 19th century and built of stone and wood in the Black Sea style of architecture. Admire the Marieta Stefanova House, the Kreanoolu House, the Todor Zagorov House, the Kurtidi House, and the Dimitri Laskaridis House. Spend the afternoon enjoying the old town and the nearby beach. In the late afternoon, your vehicle will return you to your hotel in Varna.